One More Folded Sunset: On their Way? 147 and 149 14th Street were sold last month to developers with a Mill Basin address. The garages are set for demolition, and one assumes that the houses will suffer the same fate. The houses are shown on 1880 maps of the area, and were built as semi-detached pairs. 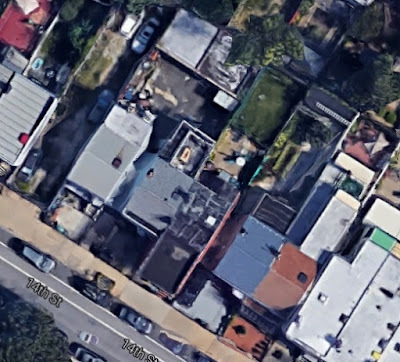 147 (left) is missing its partner (now a vacant lot), but 149 has its twin, albeit hidden under a front extension. You can see a portion of 151's original roof in the picture above. Up the block 153 and 155 still have their original configuration, It's a little hard to make out, but an aerial view shows the two-and-a-half pairs with their matching rooftops. Unlike the later brownstone & brick developments of the late nineteenth and early twentieth century, farther north & east, the buildings round here - mostly wooden and of earlier construction - arrived in piecemeal fashion, in isolation or in clusters. I like them all the better for their lack of conformity. In 1894, police officer Patrick Devoy was living at 147, "a modest two story and basement frame house." A Brooklyn Eagle article from that year describes his years of service, including twenty years as a detective at the Astor house, from 1849 to 1869. According to the Eagle, the Astor was "the principal hotel in New York" in those years, and its prominent guests included Abraham Lincoln. 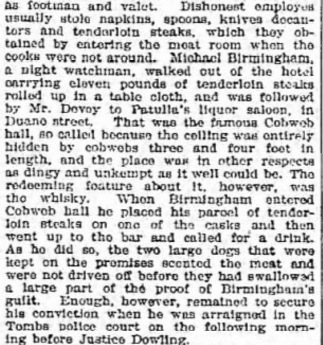 It was also rife with petty crime, and the article crackles with lively accounts of pilfering and fraud. Here's a meat caper.